Tone 9 brings the Intention of Patience to see the bigger picture. There is something more to learn. Tone 9 is all about completion. Tone 9 warns there will be suffering to bear if we fail to look again, from a Higher Perspective. We’re seating the Truth of our Divine Identity. Star/LAMAT holds the power to multiply all things to Abundance. 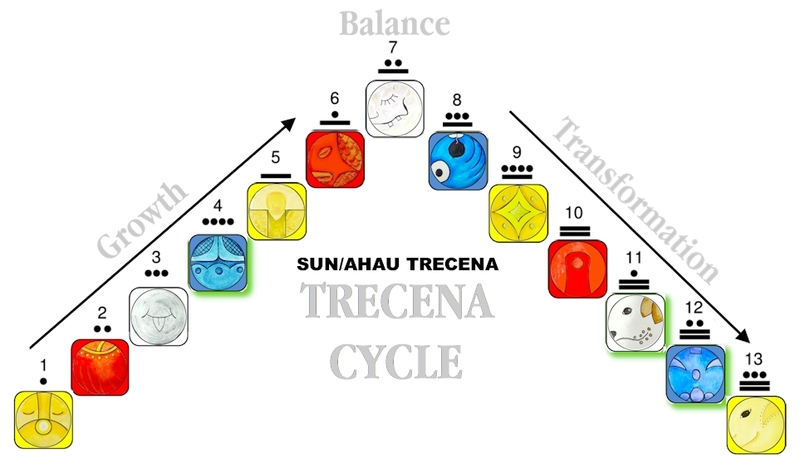 Sun/AHAU is guiding us to see it. We can learn something more about our Mission of Love through the Creator’s perspective. Star/LAMAT is called a day of “pure luck.” Whatever we focus on will be Multiplied to Abundance. The Rabbit is LAMAT’s totem, and the Cherokee Day Sign. The Rabbit is a cauldron of creation, overflowing with Love. The Rabbit’s loving nature is soft, gentle, and vulnerable. LAMAT is the scion of the Creator, identifying us as the first descendants of a Divine Light. Star/LAMAT resides in the South, the direction of our Relationships with one another and the Natural World. LAMAT offers a way to draw us into Right Relationship. LAMAT encourages an open Heart and Love that shines equally in all directions. 9 Star/LAMAT will complete our Transformation by raising our Consciousness to the Justice and Provision that Multiplies our Unconditional Love. LAMAT is a symbol of Venus, the brightest Star that shines its own Light, second only to the Sun. Venus shines as the Morning and the Evening Star in cycles that relate to the Human gestation cycle. LAMAT identified Human as a Personification of Light. Stars naturally shine in all directions, holding the natural intention of Harmony and Balance. The only challenge is when Star becomes too agreeable, too generous, or when its rejected Love causes fear or resentment. So are we weakened when we feel we’ve given too much. Our Love ceases to bless the whole equally when it’s focused in one direction. We lose our Power, giving and giving where there’s no equal exchange. We miss the Joy that defines the experience of Love when we try to earn it. We are actually turning our Light inward when we’re shining for the Intention to Receive. Our Love is not equally shining when one receives more than another. I’ve found this tendency in myself in a situation where it was difficult to make a connection. The Love I tried to give never received the equal exchange, so I tried harder. Time and again, I left the interaction deflated, where my attempts at kindness and love fell flat. Sometimes it’s very hard to see when the Ego steps in and Love is given for a Reason that holds a condition. Though the Truth that healed it was when I realized that there were other people in this same place and time, who do return an equal exchange. They were receiving much less of my attention, as I was focused on the “hold-out” of Love. In the very same place I couldn’t find the Love of One, there was Love waiting to be shared by others. If I had shined my light equally, I would have left with a Sacred Exchange. We have to weigh our own Love too shine equally in all directions. Star/LAMAT shines for the Sake of Love to Multiply Love to Abundance, instead of focusing its Love in one direction or another. The Sun is our guiding Light. We can focus on the kind of Love we receive from the Creator to become a Personification of Divine Light. The Sun offers the Illumination of Light, Life and Happiness. Our Love was meant to be a Blessing for everyone, shining in both Darkness and Light. The Creator’s Love is defined by Dog/OC, the nahaul that Lives for the next opportunity to experience an exchange of Unconditional Love. The Dog is the pack animal that sees the Happiness of the Whole as an Intention equal to its own Happiness. Dog seizes the opportunity of Loving the Whole. Dog Knows that on the Giving Side of Unconditional Love, there’s an opportunity to experience Love with everyone. Giving Unconditional Love equally all around, we leave the Sparks to do their own “magic.” When we offer a kindness without expectation of a return, the exchange isn’t the motive. Unconditional Love is eternal. When we leave it behind without any conditions, the “magic” is “pure luck.” The Unconditional Love that we give for a Divine Intention, an Intention greater than the return, our Divine Love is held in the Hand of Divine Will. There will always be a Divine Return, promised by the Creator’s Divine Justice. The Creator Knows where Love is waiting and will manifest the return in its Divine Time. The Love we give equally without condition waits forever. If it’s not seen in the Light of the Giving, it could become the Light that shines in the darkness. When Love is needed, when a friend is needed, our Light may be the Love they remember. It’s beyond Human understanding what Miracles the Creator can manifest from the Love that waits and keeps on shining. The Divine Creator holds all the Power to Direct the Light of Love. Only the Creator knows everything that’s needed, and the Divine Time for everything. We are only the foot-soldiers, Creating Divine Sparks of Light that circle the One Divine Light. Our Light will appear exactly when its needed. LAMAT knows no boundaries of Love. LAMAT guides us to embrace our own talent of Love. We each have something unique to give. We’re guided to see our own special talent. Our Love comes across in many ways. Some Love shines as light-hearted humor. Some love shines through the talents we share with each other. Love shines through every creation of Beauty and Happiness. Our Love will carry our signature as the Giver, marked for a Divine Return back to the original source of the offering. Star/LAMAT can present a “jumpy” energetic. On Star/LAMAT, the day that multiplies what we focus on, our focus may be all over the place. LAMAT can add some trepidation about keeping our thoughts on track. Again, the Rabbit’s tendency to try too hard can present a challenge. The Answer we can always turn to is Divine Intervention, our Relationship with the Creator. This is a good day to start out sharing our Intentions with the Creator, and asking that a Divine Agency uphold the Intention on our behalf. When we discover thoughts have trailed off in a direction of a negativity, we can recover easily, standing on the Truth that by a Divine Provision our Love will be Multiplied to Abundance. Make a Wish on our Brightest Star and Love in all directions. The Love we shine to others, can be an Intention of Shining for the Creator. Love given for the Sake of Love, is sent directly to the Creator for a Divine Distribution in Harmony with every human need for a Miracle. When our Love is gathered together by the Creator, there is enough to Light all the Stars in heaven. To all my relations, may we willingly give our Love equally in all directions. May we Know that all our Love is eternal, and gathered up by a Divine Light. May we know that ALL the Love we give is held in safe-keeping with a Promise of Return. May we consider all the Love the Creator has at Hand through the Hands of Love Below, and remember that Unconditional Love is an experience of Beauty and Happiness, no matter the Source of the return. The Love we missed from one, can be returned by the One or Another. Our Love deserves a Divine Return, more than just a human exchange. The Greatest Power in the Universe is the Song of Love, meant to go on forever. That’s the Return of Divine Justice and the Sacred Exchange for our Love. Circling the Sun, our Direct Source of Life, Light, and Happiness, Love will always be returned. May we seize the opportunity to Multiply our Love to Abundance. May we see that we are all Sparks giving Light. We are all waiting for the Divine Return. We’ll receive it from the Whole when we all see the Light shining in each other. The Love we missed is waiting. Every Human wants to Love. Our Love will wait until eyes are opened to see it. May we give thanks for the Creator’s Blessing of Abundant Love that never ends, Love that could only Multiply itself to Infinity. May we Multiply our Dreams of Love to Abundance, loving Softly with Gentleness and Vulnerability that Humbles its own Will, and waits for the Promise of a Divine Exchange. The Creator can apply our Light of Love, when it will be seen as a Miracle. May we imagine all the Love that human has Divinely Offered, all stored up and waiting. The answer is inside of us. We only have to see all the Love we’ve overlooked, and all the Love that’s been given to us as through all the Blessings that are Still waiting to be Seen and Acknowledged. We might See the Light, that the rejection we experienced wasn’t the Intention of the Receiver, but the result of a condition that we unconsciously held in the Offering.